Spain’s excesses are a lesson to all other cities and downtowns trying to revive their future through a focus on arts, culture, and sports. Spain’s regions spent billions competing with each other to build prestige projects when the economy was good. Now the young are being crushed by the debt burden, which promises to cause a Greek-style disaster which many Spaniards are starting to blame on Europe. On the way to the docks in Valencia, past rows of dreary blocks of flats, is a fabulously expensive opera house built to get the Spanish city noticed, no matter the price. Valencia, Spain’s city of arts and sciences. Photo by KΛ13. The building, centrepiece of theis the kind of experiment in contemporary architecture on which Spanish cities spent billions of euros during the giddy decade to 2008 – when the property bubble burst and the economy crashed. An arresting, glimmering white building that looks as if it could have just flown in from outer space, surrounded by pools of cool blue water, it was supposed to rival the Guggenheim Museum in Bilbao or the cityscape of Barcelona, up the coast to the north. It seemed expensive at the time. 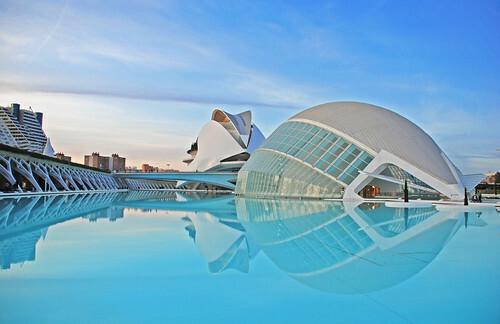 But it is only now that Valencia understands the true price of architect Santiago Calatrava’s bold vision. The city, Spain’s third biggest, is so mired in debt that last week it had to turn to Madrid for a €2 billion bailout – setting a precedent for other Spanish regions. Within days Murcia region had followed suit and much larger Catalonia, which is €42 billion in debt, is likely to do so shortly. Between them, Spain’s 17 regions owe an estimated €140 billion. The dawning realisation of what this could mean for Madrid’s own debt problem has driven Spanish borrowing charges to a dangerous new high, and raised new fears about the entire country’s need for an EU bailout. In Valencia, the recession means that hospital wards are closing, local taxes are rising, and half of Valencia’s young people are out of work. Young people like him who grew up in the good times have been worst hit by the crash, and the middle class believes it has borne the hardest burden. Spain’s dire and still worsening economic problems are now causing serious concern far beyond its borders – not least in Brussels, Frankfurt, and Berlin, where fears are growing that it will need another gigantic bailout. After Ireland, Portugal and Greece, this may be one that Europe is simply unable to afford. Several years of economic recession in Spain have started to expose corruption scandals, incompetence and overspending that cost billions. The state of the economy looks much worse than anyone thought a year ago. A series of banking scandals in the past few weeks have made the City of London look reputable by comparison – and now borrowing costs are rising, markets have scented blood, and Spaniards once confident of their economic fundamentals are now wondering how far they are going to fall. Excess during the good years, especially by regional governments, seems foolish now. “We are becoming beggars in a city of expensive wonders,” joked one jobless man who sells chewing gum to make a bit of pocket money. The City of Arts and Sciences, a complex of museums and performance spaces, is the most extraordinary example of excess. Construction began in the 1990s but the opera house did not open until 2005. The initial price estimate for the project was €300 million, but its cost rose steadily to €1.1 billion. Santiago Calatrava, the Valencia-born architect, was supposedly given carte blanche with the project. But spending fever gripped everybody in those days. Mr Rodriguez remembers school friends who bought BMWs when they got their first job. Instead of going to university, many went to earn good money on building sites. Now they are all on the dole. The big projects were not just a matter of municipal vanity. When Spain joined the euro its 17 regional governments had access to cheap money, and wanted to spend to attract the international tourist business. Fierce competition between cities drove up fees. Billions were lavished on theme parks, museums and art galleries. Every city had to have a lavish university, and be connected by an expensive network of high-speed trains. Politicians were under pressure to outspend each other, and Valencia was determined to outspend everybody. he is not a popular man now among a population reeling from spending cuts. A spectacular €2.4 billion new harbour built for the America’s Cup in 2007 now lies almost empty. Castellon Airport, north of Valencia, cost €150 million but no commercial flights have landed since it opened in March. Private developers were swept up in the excitement, and blocks of empty and half-built flats now disfigure the tourist beaches north of the city. The man blamed for much of this mess is Francisco Camps, president of the regional government for eight years until he was forced to resign last year amid a series of corruption scandals in his conservative opposition People’s Party. Mr Camps, 49, was once spoken of as a possible future prime minister. He always denied any wrong-doing and was cleared at a trial this year for corruption, after being accused of accepting €12,000 worth of suits from a business contact, but his career is widely regarded as finished. Local leaders like him all over Spain, who were feted and repeatedly elected during the good times, are now vilified for spending too much on vanity projects. Europe is also being blamed. “There is growing anger with Germany, a feeling that they are telling our politicians what to do – and anger with our politicians that they are doing it,” said Vicente Anyo, 60, dean of the university’s sports science department. An expert in organising events, he watched in astonishment as money was poured into prestige projects with little hope of making a profit. Now he fears the consequences. “The cuts are severe and it is beginning to look as if we are at the start of a Greek-style crisis,” he said. “The difference is that here we have a lot of major companies and industries, but much will depend on what the EU decides to do. There is not yet the widespread poverty that has afflicted Greece. Unemployed young Spaniards can rely on two of their traditions – help from the extended family, and work in the black economy. But as recession drags on, life will get harder. Anger with discredited bankers, developers and politicians is showing signs of turning into a protest movement which threatens parties of both right and left. Student leaders and union bosses have already started demonstrations and strikes. There have been protests since the beginning of the recession, but now people talk about the calm before the storm.